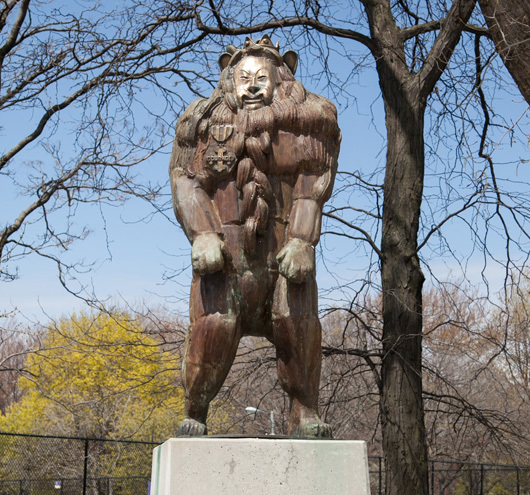 L. Frank Baum (1856-1919), author of more than 60 books including The Wonderful Wizard of Oz, once lived in Chicago, several miles from what is now Oz Park. In 1976, the park was officially named in his honor. Residents of the surrounding area loved the theme of the park, and raised money to commission four sculptures honoring Oz characters. Despite his name, the Cowardly Lion wasn’t entirely a coward. He was able to stand up and face his fears, which in fact made him very brave. For the famous 1939 film the Cowardly Lion’s costume was made of real lion pelts and weighed over 100 lbs, which must have been very heavy for the actor, Bert Lahr. For more about Chicago Public Library, click here. For more about Lookingglass Theatre, click here.